In order to produce ISPM15 compliant packaging you must be a member of the UKWPMMP and undergo six monthly assessments to ensure the packaging you produce complies with the ISPM15 standard. To join the UKWPMMP you must complete, sign and return the Application for Registration. Once your application and payment has been received you will be sent a letter of welcome, your FC Number will be given to you when you have booked your first assessment, with one of the Approved Assessment Agencies. Only when you have successfully passed an assessment are you entitled to produce ISPM15 compliant packaging. The UK Wood Packaging Material Marking Programme is administered by TIMCON, acting on behalf of the Forestry Commission and Forest Service. 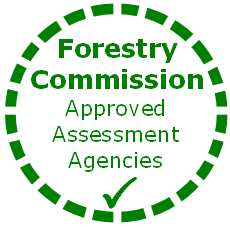 On receipt of an acceptable application, you will be advised to arrange for an independent assessment agency, recognised by the Forestry Commission and Forest Service, to formally assess your ability to carry out, in a proper manner, the approved measure(s) to which the application relates. Alternatively, where pre-treated wood is used, your systems to ensure proper marking of wood packaging material manufactured by you, together with appropriate audit trails and records will be assessed. When you apply for a certificate you must nominate a Designated person. This person must have full technical knowledge and experience of the wood packaging material production methods specified in your application. The Designated person must be available during the assessment process and be able to ensure access to material, production areas and equipment, and all relevant records. The sources and types of wood used, and reconciliation of volumes in and out and stock balances (receipts and sales). The treatment methods used at the premises, for example, the capacity of facilities and their ability to achieve the required technical standards. The available facilities for segregation of ISPM15-treated material from that which is not treated. - signs of live pests. The Plant Health (Wood Packaging Material Marking) (Forestry) Order 2006 imposes an obligation on manufacturers to ensure that they can demonstrate the integrity of their WPM supply chain (process, documents, products) from the source of ISPM15 compliant wood to production and marking of the finished product. The Order recognises the approved measures set out in ISPM15, which are either heat treatment or methyl bromide fumigation. However, as the storage and use of methyl bromide was banned in the EU in March 2010, this treatment option is no longer permitted within the UK Wood Packaging Material Marking Programme. The Order also introduces a number of offences and associated penalties for unauthorised or improper use of an ISPM15 mark. Where you are subject to ISO9001 Quality Management Standards audit, and your auditor is approved by us to perform WPM Programme assessments, it should be possible to combine the two. You must pay a registration fee and an assessment fee to join the UK Wood Packaging Material Marking Programme. The registration fee of £400 must accompany your application and should be paid to TIMCON. An initial assessment will be carried out to ensure that you are able and willing to meet all of the requirements of the Programme. This assessment and ongoing six-monthly re-assessments (see Renewing a certificate at the bottom of this page), will be carried out by one of the independent agencies recognised for the purpose, click here. You will be responsible for arranging a time for your assessment with the agency of your choice and for payment of associated fees, negotiated with them by you. The holder of a certificate may apply for renewal no earlier than one month before its expiry. A reassessment will be carried out to confirm that all ISPM15 compliant WPM produced meets the requirements of the Programme. The administration fee for renewal of a certificate is £120 which is payable to TIMCON. As soon as TIMCON receive this fee and are notified of a successful re-assessment (which will be charged separately by the assessment agency) a new certificate will be issued to the person designated within your organisation. In order to ensure that assessments are being carried out properly and consistently, plant health inspectors from the Forestry Commission or Forest Service will audit assessment agencies. They will co-ordinate audits to coincide with the independent agency’s assessment visit. You will not be charged for this official monitoring. To check whether marked WPM is being manufactured in compliance with the Programme, plant health inspectors have authority to enter, without a warrant, any premises they believe to be used for this purpose (other than premises used wholly as a private dwelling). An inspector may observe the manufacturing process, examine or test any equipment, examine or take samples of wood packaging material, inspect and make copies of documents relating to the manufacture of wood packaging material and take photographs as necessary. An inspector may remove, or ask for the removal of, any ISPM15 marks, which he/she believes have been applied without a certificate or which do not otherwise meet the requirements of the Programme (e.g. where they are illegible). Certificates may be withdrawn if it is believed that a manufacturer has not complied with the provisions in the Plant Health (Wood Packaging Material Marking) (Forestry) Order 2006 (as amended). Any person from whom a certificate has been withdrawn will be notified of the reasons in writing and may apply for re-assessment within 3 months of the date on which the invitation to reapply was received by them.